Apparently all the major browsers tried to provide a zoom facility to improve the overall accessibility for the web users. Sadly that often breaks horribly your layout, if you are developing pixel precise interaction you might get a flood of strange bug reports you might not reproduce. Our way to figure out it’s value is quite simple once you discover it: Firefox scales proportionally the borders and makes the block dimensions constant, Webkit seems to do the opposite. It’s enough to check if a element with known dimensions and border width has it’s value reported as different and your can find our which is the factor. This obviously is quite browser dependent and nobody grants that in different version it might get changed, anyway so far it seems to serve us well. ACR is a flexible and quite powerfull CMS library, but users have to learn Slices and Slicegroups to be able to insert more advanced content like photo galleries, videos and a news section. To simplify this process we created “Slice Templates”. 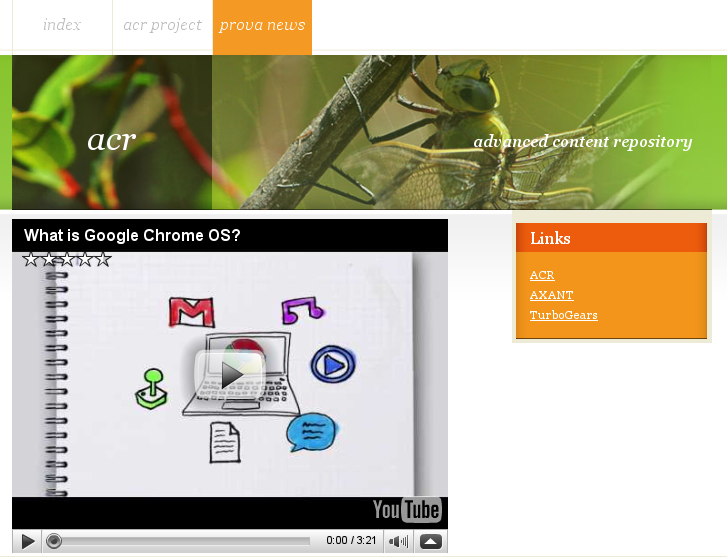 Youtube Videos which make easy to insert a youtube video inside an ACR Page. Photo Gallery which makes easy to insert a photo gallery with cool effects inside an ACR Page.